Description: The 2006-07 Long Beach St. 49ers Men's Basketball Schedule includes all 27 regular season games. 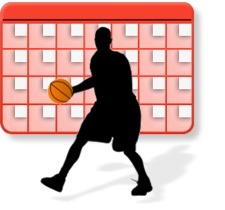 Tournament games where the opponent has not yet been determined are not included. Each event includes television broadcast information (when available) and a link to the home team and visiting team website. File Format: PST (compatible with all versions of Microsoft Outlook) This file will work in any time zone - Outlook will adjust the time for your location based on your computer time zone setting.